Museum Receives "2003 Small Institution of the Year Award"
Presentation of the 2003 "Small Institution of the Year Award". Pictured left to right are: Mary Turner, Director of IAM, Mark Harmon, President of IAM, Judy Belleville Collections Coordinator for the Labor & Industry Museum and David Oberg, Awards Chairman. Every year the Illinois Association of Museums honors the best in the museum profession in Illinois at its annual IAM Awards Program. 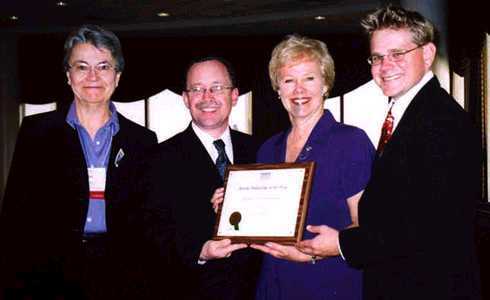 This year, awards will be given at the Association's annual conference, Chicago, IL September 23-26, 2003. The Labor & Industry Museum at Belleville, IL will receive the "2003 Small Institution of the Year Award". This is a competitive award and is granted by the 500 member organization of museum and library professionals from throughout the State of Illinois. According to Mary Turner, IAM Executive Director, the Labor & Industry Museum "deserves the recognition not only for developing a new museum but also restoring a historic downtown structure. The museum fills a nearly empty niche in the museum community by preserving and interpreting the artifacts and stories of our working men and women. Your relationship with your community and your collaboration with city government is also commendable. Your volunteers have done a great job". Judy Belleville will accept the award on behalf of the museum on Friday, September 26, 2003. At this time, it is not known who will receive the medium and large institution of the year award. The Association also grants a number of non-competitive awards in Collection Conservation, Educational Programs, Scholarly Publications, Promotional/Informational Materials and Audio-Visual Programs and Exhibits. It is interesting to note that the IAM reserves the right to not award any given prize if, in its judgement, no qualified candidate/institution has been nominated.